The most common beer glass in the U.S., holding up to 16 ounces. It’s a favorite among bars as the thick walls are durable and allow for stacking, all in an easy to drink glass. A 20 ounce staple in British pubs. The glass is tall with a slight outward curve at the top that helps to prevent chipping. Long, lean and often trumpet shaped, this glass helps maintain carbonation while showcasing color. Similar in shape to the Pilsner, the tall and thin walls of this Bavarian-inspired glass showcase color and allows more headspace for beers with larger heads. The German translation is ‘rod’ or ‘stick.’ The tall, slender shape of this traditional glass creates a more intense flavor and aroma experience and is used to service more delicate beers, amplifying malt and hop nuances. A stemmed glass with a ‘tulip’ shape designed to capture and retain aromas and flavors while it supports large foamy heads. A perfect vessel for hoppy beers. Ranging from heavy and thick walled to delicate and long stemmed, these glasses are designed to maintain a head. The wide and round shape allows aromas and flavors to rise to the top allowing for deep sips of heavier beers. The bowl-like shape is perfect for capturing the volatiles of aromatic beers while allowing for swirling to agitate them and produce an intense aroma. The thin stem and large upper body fits nicely in the hand, allowing body warmth to gently warm the beer to optimum serving temperature. Resembling a stretched out version of the tulip, this stemmed glass is shaped like a thistle bloom - the national flower of Scotland. It is reserved for enjoying stronger brews, particularly Scottish Ales. The narrow shape helps maintain and display carbonation and sparkling color while providing a strong aromatic front. The headspace and open bowl make this 22 ounce wine glass best for serving big beers with high ABVs. 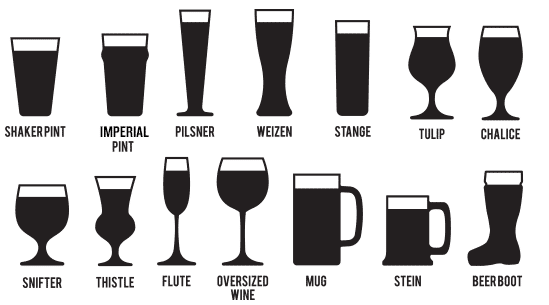 Evolving from the German beer stein, mugs are the most popular style of a beer glass. Designed for durability and insulation, this thick glass vessel allows brews to keep colder longer as sturdy handles prevent heat transfer from hand to beer. A traditional stein, the German beer tankard or mug is made of a variety of materials including pewter, silver, wood, porcelain or stoneware and is equipped with a hinged lid and levered thumb lift. The lid was implemented during the age of the Black Plague to prevent flies from getting into the beer. This glass has been around for 150+ years and used by soldiers, hunting and riding clubs. Legend has it that during World War I, the German military adopted the use of beer boots as a popular rite of passage when a commander reportedly promised to drink from his boot if a battle was won. In the US today, Das Boot is popular among German-themed restaurants, pubs and Oktoberfest inspired festivals. Enzymes, preservatives and antioxidants which are added to simplify the brewing process or prolong shelf life. Also refers to adjunct ingredients used as flavor or aroma enhancers. Beers distinguished by use of top fermenting yeast strains, Saccharomyces cerevisiae. The top fermenting yeast perform at warmer temperatures than do yeast's used to brew lager beer, and their byproducts are more evident in taste and aroma. Fruitiness and esters are often part of ale’s character. A unit of measurement used by brewers in some countries. In the United States, a barrel holds 31 US gallons. Barrel may also refer to aromas of flavors imparted in a beer due to barrel-aging. This may be oaky or boozy. The perception of a bitter flavor, in beer from is-alpha-acid in solution (derived from hops). It is measured in International Bitterness Units (IBU). Sweet, coppery-colored malt. Caramel or crystal malt imparts both color and flavor to beer. Caramel malt has a high concentration of unfermentable sugars that sweeten the beer and, contribute to head retention. Cloudiness caused by precipitation of protein-tannin compound at low temperatures, does not affect flavor. A vessel, in which beer is placed after primary fermentation where the beer matures, clarifies and, is naturally carbonated through secondary fermentation. Also called bright beer tank, serving tank and, secondary tank. Specific gravity of a beer when fermentation is complete (that is, all fermentable sugars have been fermented). Aroma of hops, does not include hop bitterness. International Bittering units. A system of indicating the hop bitterness in finished beer. One-half barrel or 15.5 U. S. gallons. A half keg or, 7.75 U. S. gallons, is referred to as a pony-keg. From the German word for storage. Refers to maturation for several weeks or months at cold temperatures (close to 0°C /32°F) to settle residual yeast, impart carbonation and make for clean round flavors. To run the wort from the mash tun. From the German word to clarify. A lauter tun is a separate vessel to do this job. It uses a system of sharp rakes to achieve a very intensive extraction of malt sugars. Skunk like smell; from exposure to light. The process by which barley is steeped in water, germinated, and then kilned to convert insoluble starch to soluble substances and sugar. The foundation ingredient of beer. Tastes tinny, bloodlike or coin like; may come from bottle caps. Describes the number of days a beer will retain its peak drinkability. The shelf life for commercially produced beers is usually a maximum of four months. Vinegar like or lemon like; can be caused by bacterial infection. A measure of the density of a liquid or solid compared to that of water (1.000 at 39°F (4°C)). Sherry like flavor; can be caused by warm fermentation or oxidation in very old beer. Yeast like flavor; a result of yeast in suspension or beer sitting too long on sediment.